The morning began much like every other game day during Jason Pominville's 15-year NHL career, until he was struck by an emotional, harsh reality during his car ride to KeyBank Center. 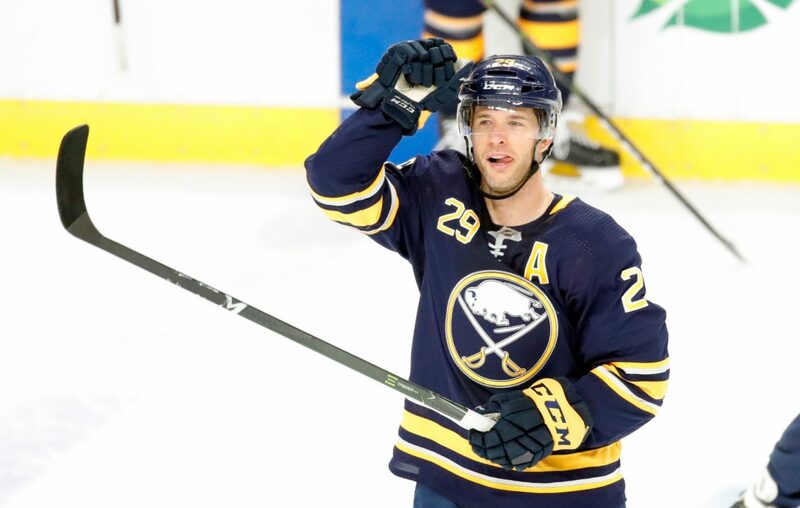 That is when Pominville, a 36-year-old winger, realized Thursday night could be his final home game with the Buffalo Sabres. The raw emotions poured out when a teary-eyed Pominville politely excused himself from a post-morning skate interview with reporters. Hours later, in the final moments of a 5-2 win over the Ottawa Senators, Pominville skated to center ice and pumped his right fist in celebration to the familiar soundtrack of a roaring ovation from the announced crowd of 17,988. The tears were gone, replaced by the same smile he showed after all the highlight reel goals and memorable wins during his storied career in Buffalo. His teammates would not allow his humble nature to prevent the crowd from honoring him after his goal with 7:03 remaining capped the Sabres' final home game of the season. "It’s been a lot of fun," Pominville said, his voice quivering. "I’ve really enjoyed every moment. I don’t know what the future holds but enjoy the next couple days and hopefully get another win and take a step back and make some decisions." Pominville is a pending unrestricted free agent and was a healthy scratch three times during the Sabres' two-win March. He remained composed when asked about his hockey future throughout the season, including the days leading up to February's trade deadline. Though Pominville's no-movement clause assured he could not be traded without his permission, the former team captain insisted he had no desire to leave Buffalo. He will not commit to extending his playing career beyond Saturday's season finale, adding that he planned to wait until he could speak to his family. His reaction Thursday morning indicated this could be the end, at least in the city he has called home for much of his career. Following a typical morning skate, Pominville became emotional when broached with the topic. His voice quivered until he finally could not hold back the tears. He wiped at his eyes, took a deep breath and did not return to the dressing room after taking time to compose himself. Pominville politely asked the media relations' staff to assure reporters he would be open to speaking after the conclusion of the game against the Senators. "He just brings such a good attitude to the rink every day and he’s been a steady influence for everyone, through all the ups and downs," Sabres captain Jack Eichel said. "He’s somebody who just goes about his business every day and we can learn a lot from him and the type of professional he is. He’s meant a lot to me, to this organization, to this city, to this team." The emotions hovered over Pominville throughout the afternoon. He served as an alternate captain with defenseman Zach Bogosian injured and, along with Kyle Okposo, escorted 95-year-old fan Anna Marie Szczepanski to center ice for the ceremonial puck drop on "Fan Appreciation Night." Then Pominville proceeded to play with the same zeal that he has shown since being drafted 55th overall by the Sabres in 2001. After starting the game alongside Eichel and Victor Olofsson, Pominville joined the fourth line with Johan Larsson and Zemgus Girgensons. The Sabres generated 18 shot attempts during 5-on-5 play with Pominville's line on the ice, while holding the Senators to seven. Eichel's third point of the night, his 28th goal of the season, gave them a two-goal lead with 8:54 remaining in regulation, yet the ovation that followed paled in comparison to the one for Pominville. Pominville took over sole possession for 10th in franchise history with his 217th career goal, when his shot from near the right-wing boards caught Ottawa goalie Joey Daccord off guard. "It was definitely nice to see that and to get that type of ovation for sure," Pominville recalled. "I’m definitely not the type of guy that likes that type of attention but the boys were giving me the signal to go to the middle and give a wave, so I thank everyone for that for sure." Pominville ranks fourth on the Sabres with 16 goals and has 14 assists with a minus-5 rating while averaging a career-low 12 minutes, 30 seconds in 72 games. That production does not match his six 20-goal seasons before he was traded to Minnesota in 2013. He and the Sabres have endured back-to-back trying seasons since his return in June 2017, however, Pominville has proven capable of contributing in a variety of roles and his work ethic allowed him to be one of the sport's iron men. Pominville has not played fewer than 73 games in a non-lockout-shortened season since 2005-06. "He's a remarkable person, number one," coach Phil Housley said. "He's a consummate teammate, a true professional. Does what we ask him to do with no hesitation. Just has a great attitude when he comes to the rink and he does things the right way. It's been invaluable to have his leadership in our room. Obviously we have two games to be played here and those things will take care of themselves, but I've just been thrilled to have him as part of our group." When the Sabres hosted Ottawa on Nov. 3, Kim and Terry Pegula commemorated Pominville's 1,000th career game by gifting him a silver Sabre. He proceeded to score two goals in a 9-2 victory over the Senators. Only 17 active players have appeared in more NHL games and only 21 have scored more goals. Before departing what he'll always remember as his home arena, he had one more message to the fans. "Thank you for everything," he said. "I left probably in tears, came back with a smile, and who knows what’s going to happen now. Definitely enjoyed every moment of it."